As the world’s population increases, seaborne traffic increases and the necessity of providing maritime patrols is increasing dramatically. The need to control Economic Zones, limit poaching of resources, combat piracy and indeed general intelligence gathering is increasing. Modern seafaring has changed significantly in technology but has not solved the problem of piracy yet. One aspect that has changed over the last years is that piracy has changed from using large vessels to small, heavily armed vessels that use stealth, surprise and fear as primary components of their attacks. Monasi consists of an array of optical sensors consisting of daylight (λ = 400-700nm) and thermal (λ = 8–15μm) cameras. Using optical and mechanical controls the system provides for continuous monitoring of 360° surrounding areas as well as pin-point spot monitoring of any identified location. 24/7 performance is provided by the wide range of monitored frequencies as well as the addition of illuminators to improve visibility as well as act as deterrents. The long distance view can allow spot monitoring in distances of up to 5nm (9260 m), or with high resolution detail of closer objects to assist with identification, including facial recognition. These cameras are mechanically and optically stabilised to combat ship motion. In addition to the seaward detection the system can be used as a local self-protection system in foreign harbours detecting access into safe zones, stowaways climbing on-board and so on. While the active component is critical in the case of a threat, the task of threat detection and classification itself, is time consuming and laborious. The Monasi system offers automated detection capability, able to recognise objects at long distances. Once recognised, objects are continuously tracked and alarms are raised once configured thresholds are breached, objects are racing towards the vessel and so on. Time of impact is calculated to assist with reaction planning. · automatic target tracking and review of recorded sequences. During incidents the system provides the operator with visual controls as above, but will also allow for the recording and display of visuals presented by other sources such as body carried cameras and other cameras used during the incident. While monitoring is necessary, it will also be important to execute defensive actions during an attack. A number of non-lethal and lethal weapons can be slaved to the Monasi system and directed and controlled if desired. These include machine guns, water cannons, laser dazzlers, acoustic bombardment, etc. 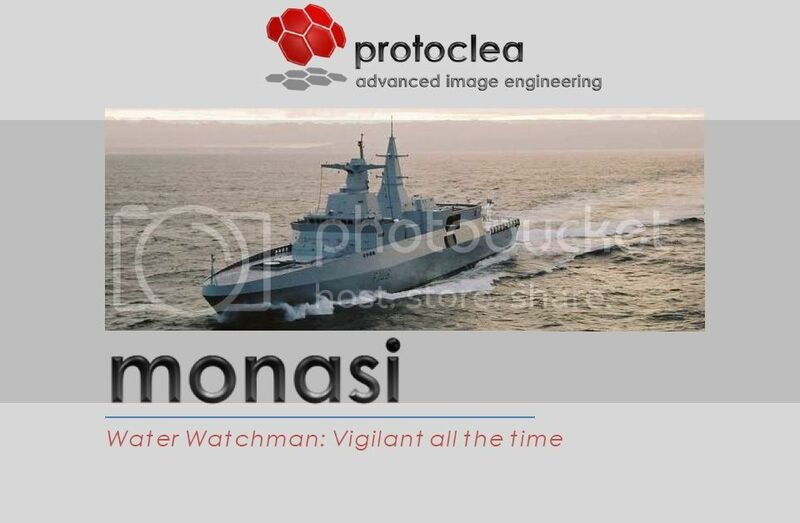 Monasi offers a real deterrent to the scourge of piracy. It also can offer basic security when in anchored in harbor as well as, of course offers and outside view in bad weather as well as during the night time.